Capturing and utilizing production data is a best practice for clients looking to optimize their production spend and ecosystem. APR has invested years normalizing production data across all our clients for benchmarks and insights. Out of 1000’s of potential data points, we determine which have the biggest impact on a client’s decision making. The AdPro Scorecard® is a series of scorecard assessments of a client's production ecosystem. APR bases the results on an analysis of qualitative surveys, data, decades of production expertise, and industry data from the APR Index®, an aggregated set of production data. Each metric is carefully analyzed and measured to ensure the methodology is tested and the insights both relevant and actionable. Benchmarks allow an advertiser to understand where they sit in the marketplace, measure their progress against industry trends, and give clarity to marketers looking for the right mix of content at the right price to reach their consumers. APR Index® is our proprietary set of aggregated production data used to identify industry trends and provide valuable measurements data to clients. APR has developed a proprietary, cloud-based content production management system to deliver. Production project and cost tracking across all media types, all brands, all geographies … all in one system. 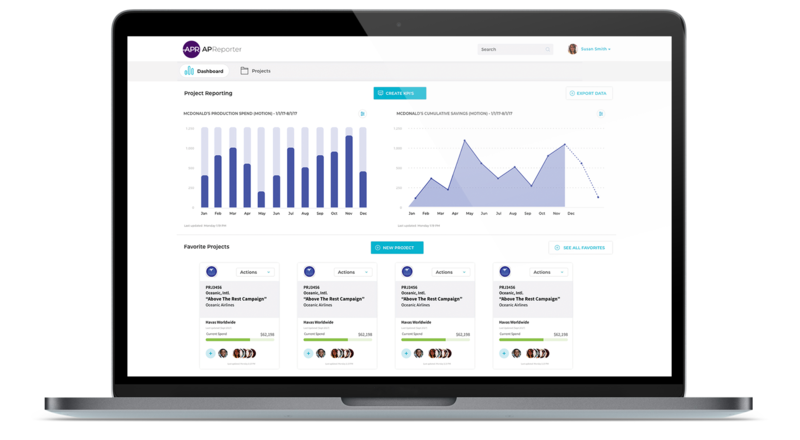 Analytic and reporting dashboard to show project and aggregated spend and savings in real time. Data and insights via periodic reporting, comparisons over multiple variables and industry or bespoke benchmarks.